Blockchain is one of those buzzwords that everyone seems to be using these days, but many don’t fully understand or comprehend the transformative potential of this technology, which is poised to be responsible for a global market valued in excess of US $60 billion by 2024. Now in the mainstream, thanks to the rise of bitcoin and other cryptocurrencies, the term blockchain refers to the use of a decentralized and digital public ledger in which transactions are recorded chronologically. 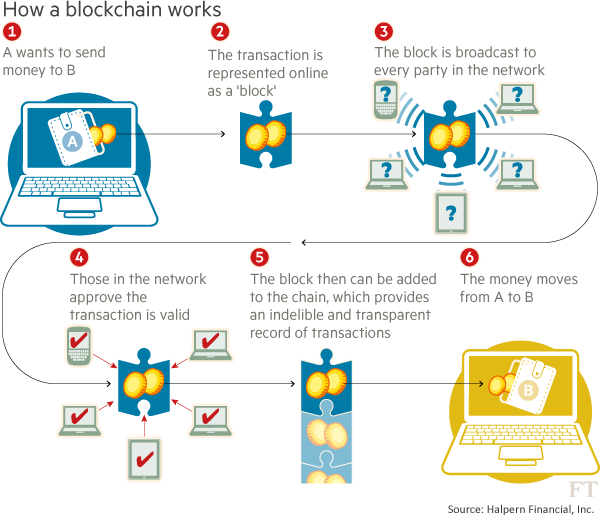 It is distinct from other forms of transaction tracking as a blockchain is not maintained by one central authority or server. Instead, a copy of the blockchain lives on every device connected to the network. Notably, in August 2017, ten of the world’s largest packaged goods and food companies representing more than US $500 billion in annual global sales, including Walmart and Dole Food Company partnered with IBM to integrate blockchain into their supply chains. At Evolve ETFs, we recently launched LINK – Canada’s first actively-managed blockchain ETF. In preparation for the launch of this fund, we have been conducting extensive research into both the technology itself and the broader sector for some time. The fact is, this is a technology that will be used in all kinds of industries for all kinds of applications – and we are talking about real products from real companies, including common household names like Microsoft and IBM. When selecting companies for the fund, there are a number of different factors we look at. The first half of our fund is invested in large-cap technology companies with active projects, products, or services built using blockchain technology. The second half of our fund is invested in small-cap companies that are solely focused on blockchain. The reason for this is simple: if you only invest in pure plays, you miss out on the larger companies that are best positioned to integrate blockchain into existing product lines, and if you only invest in large caps, you miss out on the upstart companies that may eventually grow to dominate their sector. Just think of the internet boom of the late 1990s: if you exclusively invested in small caps, you missed out on the growth of companies like Apple. For every pure play like Amazon or Priceline that dominates their sector today, there was also a Pets.com or Excite@Home that didn’t fare so well. This is also one of the main reasons we believe active management will make a difference in the sector. In every industry, there are companies who lead and companies who follow –that is particularly evident in blockchain. We are not investing in companies that have simply added “blockchain” to their name. This means conducting extensive due diligence with every company included in our portfolio, ensuring they are developing viable blockchain products and services, led by a credible management team and financing plan. It’s important to exclude companies that don’t offer legitimate blockchain-related products and services. Should a company no longer meet our criteria, we have the ability and the responsibility as active managers to make a change at any time. Passively managed blockchain ETFs simply do not have this flexibility. We can also put up to 10% in private equity and may participate in pre-IPO and IPO financing rounds, which can’t be done in a passive index-based investment vehicle. In a sector that seemingly evolves by the day, this flexibility is critical for long-term success.